Assessment of the effect of interval from presentation to surgery on outcome in patients with peri-ampullary malignancy. Amr B, Shahtahmassebi G, Briggs CD, Bowles MJ, Aroori S, Stell DA. HPB (Oxford). 2016 Apr;18(4):354-9. doi: 10.1016/j.hpb.2015.10.013. Epub 2016 Feb 3. Delayed diagnosis of alpha-1-antitrypsin deficiency following post-hepatectomy liver failure: A case report. Norton B, Denson J, Briggs C, Bowles M, Stell D, Aroori S. World J Gastroenterol. 2016 Mar 21;22(11):3289-95. doi: 10.3748/wjg.v22.i11.3289. The pre-operative rate of growth of colorectal metastases in patients selected for liver resection does not influence post-operative disease-free survival. Wigeons MG, Shahtahmassebi G, Aroori S, Bowles MJ, Briggs C, Stell DA. Eur J Surg Oncol. 2016 Mar;42(3):426-32. doi: 10.1016/j.ejso.2015.09.016. Epub 2015 Sep 30. Laparoscopic Distal Pancreatectomy Using the Modified Prolonged Prefiring Compression Technique Reduces Pancreatic Fistula. Ariyarathenam AV, Bunting D, Aroori S. J Laparoendosc Adv Surg Tech A. 2015 Oct;25(10):821-5. doi: 10.1089/lap.2015.0200. Epub 2015 Sep 22. Outcome after pancreaticoduodenectomy for T3 adenocarcinoma: A multivariable analysis from the UK Vascular Resection for Pancreatic Cancer Study Group. Elbert H, Ravikumar R, Sabin C, Abu Hilal M, Al-Hilli A, Aroori S, Bond-Smith G, Bramhall S, Coldham C, Hammond J, Hutchins R, Imber C, Preziosi G, Saleh A, Silva M, Simpson J, Spoletini G, Stell D, Terrace J, White S, Wigmore S, Fusai G. Eur J Surg Oncol. 2015 Nov;41(11):1500-7. doi: 10.1016/j.ejso.2015.08.158. Epub 2015 Aug 28. Clinical assessment before hepatectomy identifies high-risk patients. Ulyett S, Wiggans MG, Bowles MJ, Aroori S, Briggs CD, Erasmus P, Minto G, Stell DA. J Surg Res. 2015 Sep;198(1):87-92. doi: 10.1016/j.jss.2015.05.044. Epub 2015 May 29. The Interaction between Diabetes, Body Mass Index, Hepatic Steatosis, and Risk of Liver Resection: Insulin Dependent Diabetes Is the Greatest Risk for Major Complications. Wigeons MG, Lordan JT, Shahtahmassebi G, Aroori S, Bowles MJ, Stell DA. HPB Surg. 2014;2014:586159. doi: 10.1155/2014/586159. Epub 2014 Aug 14. Portal vein resection in borderline resectable pancreatic cancer: a United Kingdom multicenter study. Ravikumar R, Sabin C, Abu Hilal M, Bramhall S, White S, Wigmore S, Imber CJ, Fusai G; UK Vascular Resection in Pancreatic Cancer Study Group. J Am Coll Surg. 2014 Mar; 218(3): 401-11. Assessment of the Value of MRI Scan in Addition to CT in the Pre-operative Staging of Colorectal Liver Metastases. Wiggans MG, Shahtahmassebi G, Aroori S, Bowles MJ, Jackson SA, Stell DA. J Gastrointest Cancer. 2014 Jan 10. Partial Preservation of Segment IV Confers No Benefit When Performing Extended Right Hepatectomy for Colorectal Liver Metastases. Wiggans MG, Fisher S, Adwan H, Aroori S, Bowles MJ, Stell DA. HPB Surg. 2013; Epub 2013 Dec 11. Renal dysfunction is an independent risk factor for mortality after liver resection and the main determinant of outcome in posthepatectomy liver failure. Wiggans MG, Shahtahmassebi G, Bowles MJ, Aroori S, Stell DA. HPB Surg. 2013; Epub 2013 Nov 5. The Preoperative Assessment of Hepatic Tumours: Evaluation of UK Regional Multidisciplinary Team Performance. Wiggans MG, Jackson SA, Fox BM, Mitchell JD, Aroori S, Bowles MJ, Armstrong EM, Shirley JF, Stell DA. HPB Surg. 2013; Epub 2013 Aug 22. The comparison of outcomes between pancreaticogastrostomy and pancreaticojejunostomy: following pancreaticoduodenectomy. Somaiah Aroori, Puneet Puneet, Simon R. Bramhall, Paolo Muiesan, A. David Mayer, Darius F. Mirza, John C. Buckels, John Isaac. HPB Surgery; 1477-2574.2011. M McCavert, ME O’Donnell, Aroori S, B McAree, T Lieo, RAJ Spence. Ultrasound is a useful adjunct to mammography in the assessment of breast tumours in all patients. Int J Clin Pract. 2009 Nov; 63(11): 1589-94. Aroori S, Blencowe N, Pye G, West R. Clostridium difficile: How much does hospital staff know about it? Ann R Coll Surg Engl. 2009 Sep; 91(6): 464-9. Western CE, Wiggans M, Aroori S, Bowles M, Stell D. Preoperative neutrophil:lymphocyte ratio is not a predictor of outcome following hepatic resection for colorectal metastases. Gut. 2012; 61 (S2): A109. Western CE, Aroori S, Bowles M, Stell D. Preoperative neutrophil:lymphocyte ratio does not predict post-operative complications following hepatic resection. Gut. 2012; 61 (S2): A192. M McCavert, ME O’Donnell, Aroori S, B McAree, T Lieo, RAJ Spence. The effect of age on the role of ultrasound in triple assessment at a symptomatic breast clinic. Association of Surgeons in Training Yearbook 2008, pg 29. Aroori S, N. Blencowe, S. Chinti, R. Fallaize, G. Pye, R. West. How much does hospital staff know about Clostridium Difficile? Br J Surg 2007, 94 (Suppl 2): 2. Bunting D, Aroori S. Comparison of outcomes following Laparosocpic vs. Open liver resections. Single surgeons experience. Poster presentation on 12-13 March 2014, GBIHPBA, Lemington Spa, UK. Ariyaretnam A, Bunting D, Aroori S. Laparoscopic Distal Pancreatectomy using the Prolonged Pre-Firing Compression technique prevents severe pancreatic fistula. Poster presentation on 12-13 March 2014, GBIHPBA, Lemington Spa, UK. The effect of a single page Enhanced Recovery protocol after Kausch-Whipple’s Pancreato-duodenectomy Hitchins C, Briggs C, Bowles M, Stell D, Minto G, Aroori S. Poster presentation on 12-13 March 2014, GBIHPBA, Lemington Spa, UK. Initial experience with a multimodal Enhanced Recovery programme in patients undergoing liver resection. Hitchins C, Briggs C, Bowles M, Stell D, Minto G, Aroori S. Poster presentation on 12-13 March 2014, GBIHPBA, Lemington Spa, UK. Laparoscopic Left Hemi-hepatectomy for a large breast cancer metastasis with left portal vein involvement. Bunting D, Aroori S. DVD presentation on 14-15 November 2012, ALSGBI, RCSEngland, London, UK. Western CE, Aroori S, Bowles M, Stell D. Preoperative Neutrophil:lymphocyte ratio does not predict post-operative complications following hepatic resection. Poster presentation: the Digestive Diseases Federation Annual Meeting, Liverpool. Drains following Pancreatico-duodenectomy: Are they useful? J Ahamad, W Paxton, Briggs C, Aroori S.
Preservation fluid and ureteric tips. 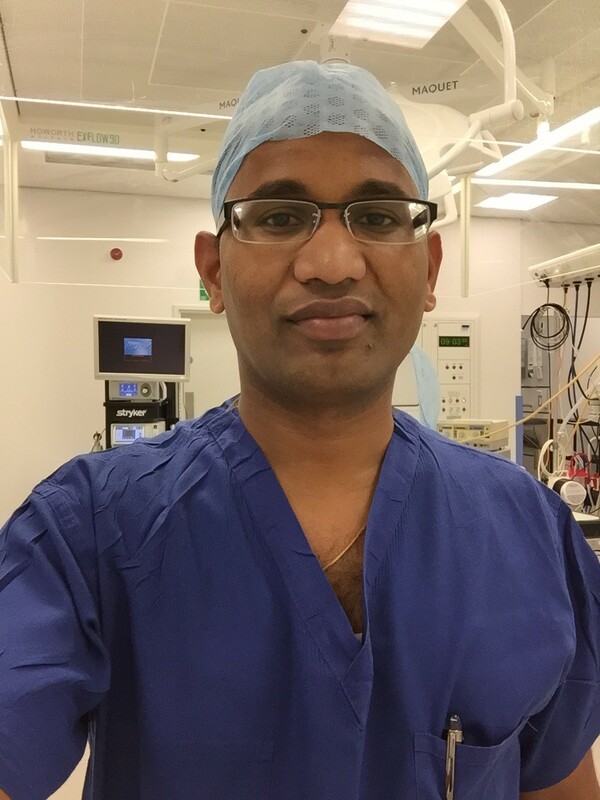 Harrison A, Cunningham, Akoh J, Barwell J, Aroori S, Rowe P.
Multi-visceral pancreatic resections (MVR): Safety and outcomes at Liver unit, QEH, Birmingham. This audit was carried out to examine the mortality and morbidity following extended pancreatic resections for various indications at the Liver Unit, QEH, Birmingham. The audit revealed that the mortality was significantly higher following MVR than the standard Whipple’s operation. However, in highly selective cases extended pancreatic resections were beneficial with excellent surgical outcomes. The audit recommended the performance of multi-visceral resection in highly selected cases. The role of Liver resection in Benign liver lesions, at Liver Unit, Queen Elizabeth Hospital, Birmingham. This audit was carried out to examine the indications and the outcomes following liver resections for benign liver lesions. The results showed that in over 40% of patients the main indication for the liver resection was suspicion of malignancy on pre-operative imaging. Haemangioma, FNH, and adenoma were the most common histological diagnosis and majority of these lesions were picked up on imaging performed for non-specific reasons. The causes of leucopoenia and thrombocytopenia following liver transplantation: I and my colleague Ms Ruth Hardstaff carried out this audit project which looked at the various causes of thrombocytopenia and leucopoenia following liver transplantation at Liver Unit, Queen Elizabeth Hospital, Birmingham. We have found that Mycophenolate, Azathioprine, and Valgancyclovir were the main causes of leucopoenia following liver transplantation.